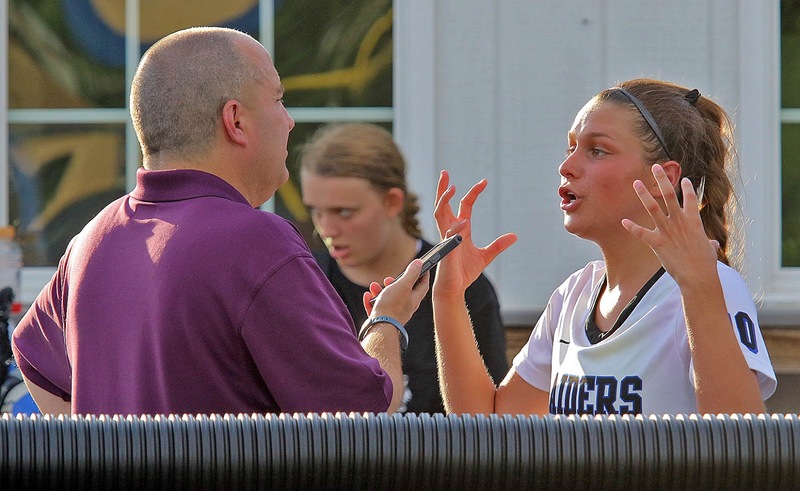 Hanover catcher Lauren Hughes wondered what all the fuss was about after the third out of the top of the seventh inning Thursday night at home as her Hawks battled county rival, and new Region 4B rival, Patrick Henry. "Actually, when the girl got out in the last inning, I had no idea it was the last out. I was like, why is everyone so excited? We've got one more inning to go, guys!," Hughes recalled. "And then everyone started lining up and I was like, 'oh my gosh, it's time to go!'" Hughes was laser focused on guiding freshman pitcher Leslie Currie, who entered in relief of Ellen Palya, in the sixth inning of a 2-2 tie, through a seventh inning that saw Hanover enjoyed a 3-2 lead. When Hughes noticed the scoreboard, she realized it was now a 3-2 victory, a huge win for a young Hawks team left behind a year ago by Atlee, Lee-Davis and Patrick Henry as they all made deep postseason runs, Atlee the deepest of all. It was Hughes who scored the winning run in the bottom of the sixth off Patrick Henry freshman Riley Dull, who entered in relief of Charlotte Mitchell in the third inning. Hughes singled up the middle, moved to second on a passed ball, then to third on a Palya ground out to shortstop. After Julia Mardigian hit a liner back to Dull for the second out, Jenna Ways came to the plate. A Dull pitch got away from Emma Keys behind the plate and Hughes raced home to break the tie and return the lead to the Hawks. Currie retired the Patriots (5-1) in order in the seventh to complete a victory that marks the return of Hanover softball to main stage after an up and down 8-9 season a year ago. What's most impressive is this is happening with a youth-laden squad. And, for second year head coach Becca Mayhew, coming into the 2018 season, the first focus was all about the mental game. "I think the biggest thing is confidence and leadership, they go hand in hand," Mayhew said. "Our coaches have to show confidence in our players and leadership, so our captains have a lot of leeway, and they're able to trickle that down and give the girls more confidence." The Hawks struck first in the second inning, taking advantage of a third strike passed ball to Bella Pastore with two outs. Rylan Hubbard launched a double to the right field wall that brought Pastore all the way home for a 1-0 lead. Jessica Russell next singled up the middle, scoring Hubbard to make it 2-0. Palya went five innings, but was touched up in the fifth frame as Erin White led off with a towering home run to left field to get Patrick Henry on the board. Jamie Hughes walked, then, on a sacrifice bunt by Dull, Hughes got the green light to not only take second, but head to third base, too. It caught Hanover by surprise. Pastore's throw from first to third base was high, allowing Hughes to take off and slide in safely at home to tie the game at 2-2. "It definitely caught us off guard, but the thing I focused on was how we bounced back. We never gave up," Mayhew noted. "We're in the dugout, and someone said, girls, it's 2-2, let's go. We're still in this. I think that was a big mentality shift for us because, before, it would be like, we're not winning anymore, and the mentality would go straight down. But not today." For the Patriots, the end of a busy stretch of games going into Spring Break hits a sour note, as they know there were opportunities to grab the win. But a loss in an evenly played game against a future playoff rival could be just the elixir Patrick Henry needs, to refocus, regroup, and prepare for April, which sees trips to #5 Lee-Davis April 13th, King George April 18th, then finally returning home to host #4 Atlee on April 20th. Their rematch with Hanover is in Ashland on April 27th. As for the Hawks, who have to hope Spring Break doesn't break their early season mojo, they return to action at Highland Springs April 10th. They get Atlee on April 13th at home. Hughes has enjoyed being the underdog team coming into this season. "We are a very young team and I feel like we get underestimated because of that," Hughes explained. "We've worked hard in the offseason. We work hard on the field. We use that to light a fire under us." The good news for Hanover is it has worked, and helped them finish unbeaten in March. The bad news is, Hanover softball is a secret no more. In other action, #5 Lee-Davis and #4 Atlee went to extra innings before the Confederates scored two runs in the eighth inning and made them stick as Lee-Davis finally earned a win over their biggest rivals 2-0 Thursday night in their first meeting since the 2017 Group 5A State Championship last June, won by Atlee 1-0. The spotlight shines on high school sports each Friday at 9:30am on the "Black And Drew Sports Huddle" only on ESPN Richmond! 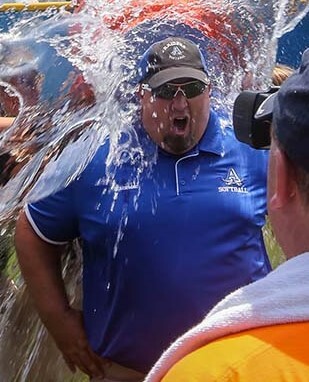 This week, Bob Black, Andrew Wallace and Rob Witham of The RVA Sports Network welcome Atlee Raiders softball coach Tom McIntyre, who will talk about the pressures of being the three-time defending state champions, another chapter in their storied rivalry with Lee-Davis Thursday night, and why softball in Hanover County has been so successful during this decade. You'll also get the latest news and headlines from around the RVA high school sports landscape. Presented by Farm Bureau Insurance, "RVA Locals Only" is heard on 99.5, 102.7 FM, 950 AM and online at ESPNRichmond.com every Friday morning at 9:30! 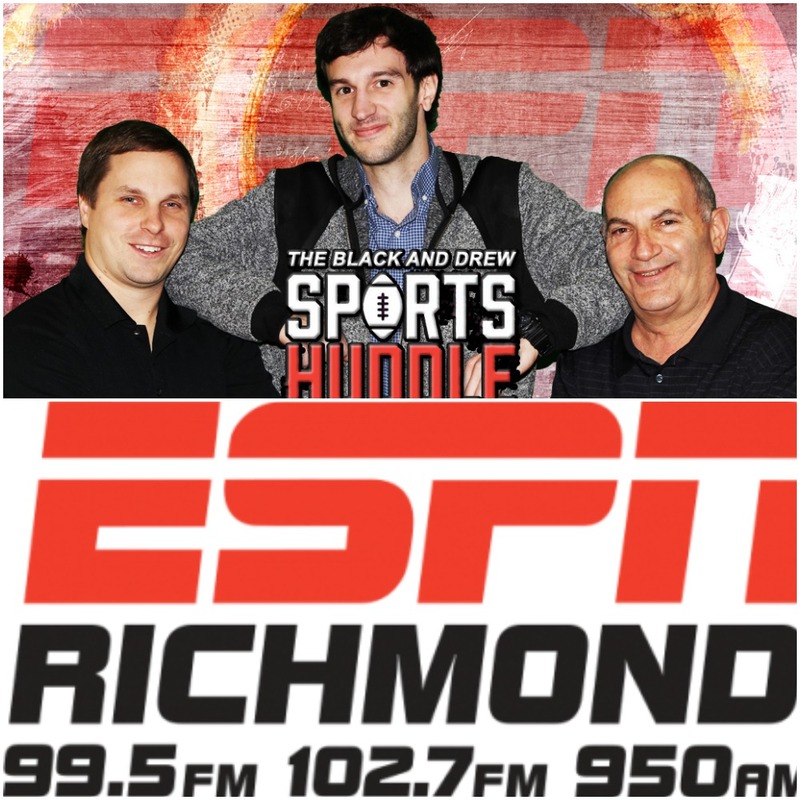 You can also hear ESPN Richmond on your phone by downloading the ESPN Richmond app on Google Play and the Apple Store! Listen live tonight (Thursday) at 6pm on the YouTube Player below! Late Tuesday, employees of Lakeway Publishers, the owner of both the Herald-Progress of Hanover County and The Caroline Progress of Caroline County, were informed that this week's editions would be the last ever published. Without warning, 137 years of service to Hanover County, and 99 years of service to Caroline County ends. This is the current start reality of the dying world of print journalism. As many of you may know, I wrote the sports section for The Herald Progress since December, 2011. Out of that work came an idea to go on Twitter, which merged with this blog to become a website, which begat many other things which are all now under the umbrella of The RVA Sports Network. 1) Obviously, our sports writing will no longer appear in print in The Herald Progress after the March 29 edition. 2) We will, however, continue to write about the sports of Hanover County, and be free to publish those stories online in a much, much quicker fashion. Rather than collect stories, send them in Monday nights, then have them published on Thursdays, if a game happens Friday night, you can expect a story on it either late Friday night or when you wake up Saturday morning here at HanoverCountySports.net. This website is about to get very, very busy. 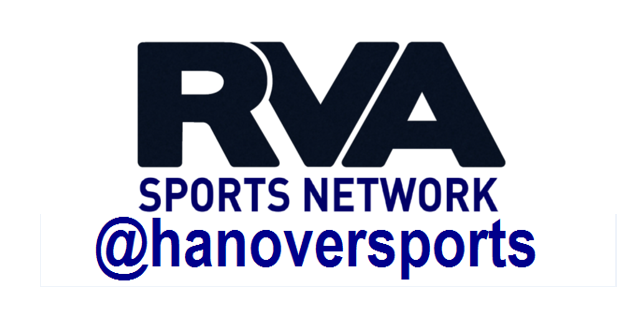 3) Watch for more game and other stories, too, outside Hanover on RVASportsNetwork.com. We are committed to you and the stories in Hanover County that deserve to be told for as long as we're able to do so. More news later. It goes without saying, but should be shouted: THANK YOU for your incredible support all these years, dating back to the 2002 debut of high school football on WHAN Radio. The Raiders are off to a good start in a season where they hope to not only repeat their historic run to the Class 5 State Tournament, they hope to make it all the way to Championship Saturday. The Titans are looking to make noise in Class 6. It's an early season lacrosse showdown, Monday at 7pm only on RVA Sports Network! Use the YouTube player below to listen as Hanover collides with James River on the season premiere of The RVA Sports Network High School Football Game of The Week Friday night at 7pm! ATLANTA – The Women's Basketball Coaches Association has selected sophomore Kelly Williams (Garysburg, N.C/Halifax Academy) as an All-American, closing out a tremendous season for the second-year player. Williams was one of the national leaders in scoring, rebounding and blocking at various points of the season, including all three at the same time during the month of January. "The 10 members of the 2018 WBCA NCAA Division III Coaches' All-America team are well deserving of this recognition, and the WBCA congratulates them for their accomplishments this season," said Danielle Donehew, executive director of the WBCA. "These young women have worked to elevate themselves and their teams to an elite level and through their exceptional talents on the basketball court, they have lifted the women's game." The honors come on the same week as Williams' selection as a College Sports Information Directors of America (CoSIDA) Second Team Academic All-American, the D3hoops.com South Region Player of the Year, Richmond Times-Dispatch All-State Team for Division II/III and a Sports Illustrated "Face in the Crowd." During the ODAC Tournament, Williams set new records for total points scored (79) and total rebounds (60) in a single tournament. Williams was been named the ODAC Player of the Week eight times this season to total 12 in her career – the most decorated R-MC ODAC Player in the Week in history. She has received the U.S Basketball Writers Association National Division III Player of the Week honor four times in 2017-18, more than any other player at the Division III level in history. Including one selection last year, Williams has five honors from the group. D3hoops.com named her to its Team of the Week twice this season as well. Williams finished the season with 736 points, an average of 25.4 points per game, which still is the national lead for both marks. She finished with 527 rebounds, the national #1, as well as an average of 18.2 per game, which is still second-best in the nation. Her 28 double-doubles is a national lead as well, as is the number of field goals made with 269. Williams was also the national leader in free throws attempted and made with 304 and 197 respectively. Williams is Randolph-Macon's first WBCA All-American selection since Molly Ariail was selected in 2009-10. ASHLAND, Va. – The membership of the Women's Basketball Coaches Association has recognized Randolph-Macon Women's Basketball Head Coach Carroll LaHaye as its South Region Coach of the Year. With the honor, LaHaye becomes a finalist for the United States Marine Corps/WBCA Coach of the Year award. Named in honor of college basketball's all-time winningest coach, the Pat Summitt Trophy is presented annually to the United States Marine Corps/WBCA National Coach of the Year in each of the five membership divisions – NCAA Division I, NCAA Division II, NCAA Division III, NAIA and two-year college. The criteria in order of priority are: Team success during current season; Team improvement from previous season; Fulfillment of team potential; and professional manner and attitude of coach. LaHaye completed her 36th season with the Yellow Jackets in 2017-18. Amongst the successes of this season was her 600th victory against Lynchburg 71-59 on January 20. This year's 23-6 record is a seven game improvement over 2016-17's record of 16-12. The season also marked LaHaye's 24th winning season and 14th 20-win season. 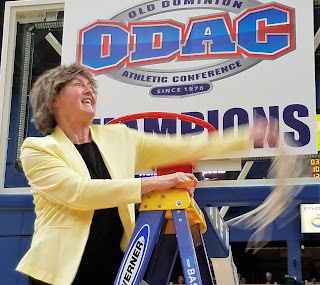 R-MC won its ninth ODAC Title under LaHaye in 2017-18, winning the ODAC Tournament with a 72-68 victory over Emory & Henry. The win provided the team's 10th NCAA Tournament appearance, all under LaHaye. R-MC's tournament win over Valley Forge marked LaHaye's 14th NCAA Tournament win. Overall, LaHaye owns a .631 overall winning percentage in her time at Randolph-Macon and a .735 winning percentage over ODAC opponents in the regular season. LaHaye ranks 7th nationally in total number of victories in Division III Women's Basketball and 30th for most wins among all active head coaches at all divisions of NCAA Women's Basketball. She ranks 17th in most victories for all Division III coaches in history. LaHaye has earned WBCA Coach of the Year honors on a district/regional level before: in 1995-96, 1997-98, 1998-99 and in 2006-07. All five United States Marine Corps/WBCA National Coaches of the Year are presented with The Pat Summitt Trophy during the WBCA Convention. Listen at 6pm as the three-time defending state champion Atlee Raiders face an early test on opening night hosting Prince George on the RVA Sports Network High School Softball Game of The Week! 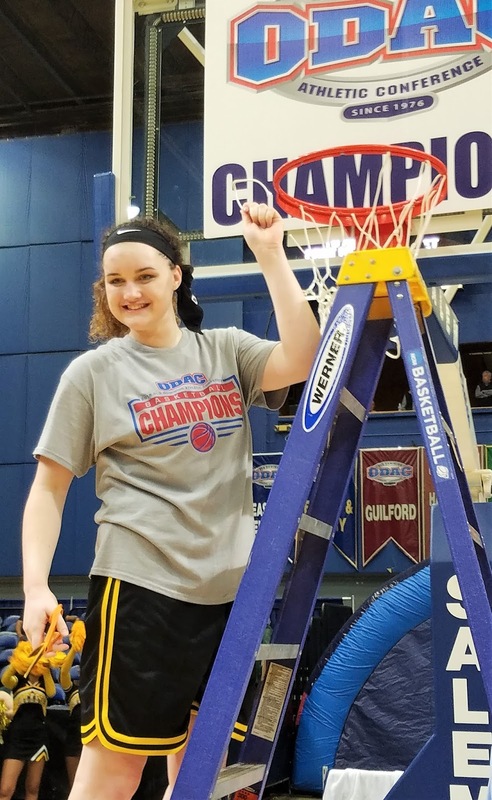 Randolph-Macon sophomore center Kelly Williams has received multiple postseason accolades ahead of the announcement of the NCAA Division III National Women's Basketball Player of The Year. Williams, an accounting major, was named Second Team Academic All-American by the College Sports Information Directors of America. Williams currently carries a 3.85 GPA. She was named First Team All-Academic in District 5. Earlier this week, Williams was named South Region Player of The Year by D3hoops.com. She will be eligible for their All-American team, which will be announced soon. Williams leads the NCAA in points per game at 25.4, is second in rebounds at 18.2, and tops the nation with 28 double-doubles in 29 games. She also set Old Dominion Athletic Conference (ODAC) Tournament Championship records for most points (79) and most rebounds (60) during a single tournament as the Yellow Jackets won the 2018 title on February 25.